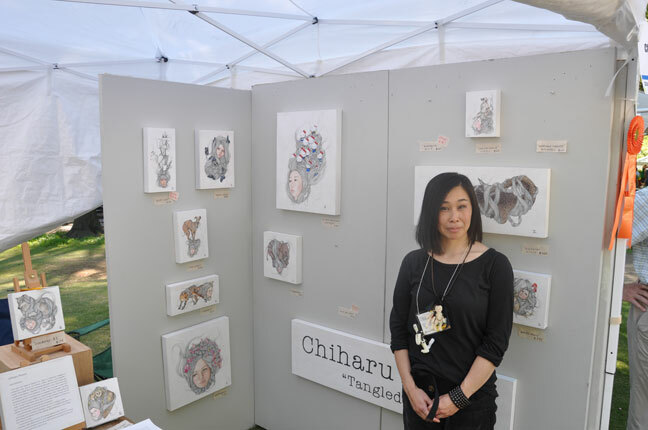 Chi immigrated to the US 15 years ago, and began to create art to express without sound what was in her head while she was taking steps to learn the English language. In her Tangled Hair series she’s, “symbolizing the different memories, feelings, and behaviors our minds create that affect our lives.” The ultra-detailed execution of her amazing paintings require the finest of paint brushes. Sometimes she even removes bristles to hone her accuracy for creating each strand of hair entangling a wide array of masterfully drawn & painted animals, even a quirky HelloKitty-inspired piece pictured here. Chi is one art talent we are glad to have with us in Bham! If you want to know which artist (dead or alive) Chi would invite to a dinner party, check out our ArtShorts Blog with her in 2013 here.